The remedy is a small Application or you may say a small addon to Google Talk which does all the trick. Its called gAlwaysIdle and is a small app. and has almost minimum fuss to be done for making it work. Install it , select the setting and you are done. 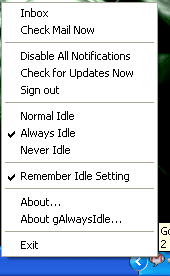 After Installing Right Click the Google talk icon in the system tray and select always Idle. Make it to remember Idle settings and voila you are done. No fuss all work. Remain Idle on Gtalk as long as you want and get rid of a few unwanted chats that may have bothered you. UPDATE : As the Official Site is Down, You can download galwaysidle from here. There are a few Issues with the current version that I have nocticed like when in Always Idle mode it does not checks for the current unread mails in the mailbox, but that may be due to the google server settings, rest its a great Application to use . Downloading that app showing some problem, can you check that again please, if possible?